OfficeUS, the U.S. 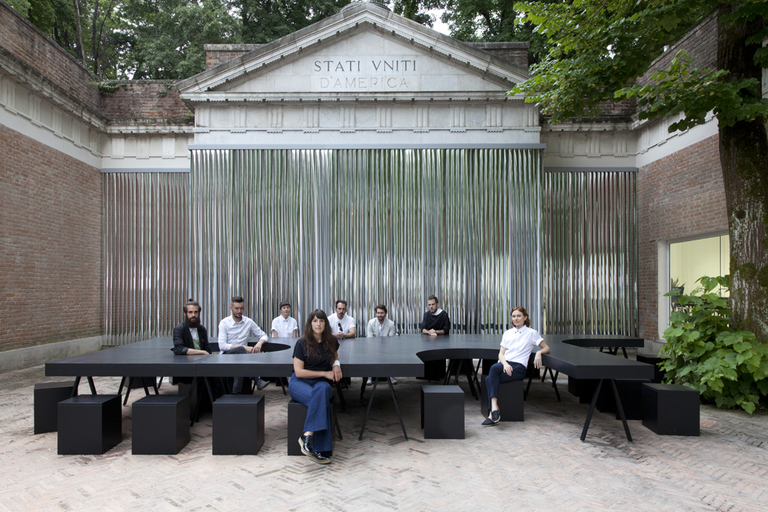 Presentation at the 14th International Architecture Exhibition — la Biennale di Venezia, announced today the Partners of OfficeUS: Arielle Assouline-Lichten, Curtis Roth, Cooking Sections: Daniel Fernández Pascual & Alon Schwabe, Manuel Shvartzberg Carrió, Matteo Ghidoni, and M-A-U-S-E-R: Mona Mahall & Asli Serbest. The OfficeUS Partners were selected from an international open call hosted by Storefront for Art and Architecture in Fall 2013. Eva Franch i Gilabert, Ana Miljački and Ashley Schafer, curators of the U.S. Pavilion project, OfficeUS, selected the partners. Over the twenty-five weeks of the Biennale, these eight architects, who include two collaborative pairs, will work in conversation with visiting experts and various outpost offices around the world to reconsider the projects exhibited in the pavilion and to construct an agenda for the future production of architecture. OfficeUS is still accepting applications for outpost offices as part of the project. Application materials can be found at http://officeus.org/apply/. Arielle holds a Master of Architecture from the Harvard Graduate School of Design, and a bachelor degree in Critical Theory and Visual Media from New York University. She is the co-founder of Slash Projects, a multi-disciplinary design firm based in Brooklyn, New York. Her work focuses on experience as a driver for new design opportunities between physical and interactive space. Prior to founding Slash Projects, Arielle has worked for BIG, Snøhetta, and Kengo Kuma Architects. She recently led a campaign seeking retroactive recognition of Denise Scott Brown by the Pritzker Prize and is passionate about establishing equality for designers through digital activism. As Partner of OfficeUS, Arielle investigates the secondary figures in US architecture and new modes of operation for empowerment. Curtis is a recent graduate of the Massachusetts Institute of Technology where he earned his Master of Architecture degree with a concentration on post-war histories and theories of architecture. While at MIT Curtis was awarded the AIA Henry Adams Medal, as well as the Ralph Adams Cram Thesis Prize. Curtis was most recently the 2013-2014 Howard E. LeFevre ’29 Emerging Practitioner Fellow at the Knowlton School of Architecture at the Ohio State University where he curated a retrospective exhibition of the work of the fictional neo-avant-garde group Superimpossible. Prior to his appointment as the LeFevre Fellow, Curtis served as the Knowlton School of Architecture’s Richard W. Trott ’61 Distinguished Visiting Professor where he taught both studios and history seminars in the Architecture and Landscape Architecture departments. He has worked professionally for Howeler + Yoon Architecture and Opsys Landscape Infrastructure Lab, both located in Boston. As Partner of OfficeUS, Curtis is the office’s Confabulist of Archival Comedies (CAC), a role which entails simulating new collective architectural memories by repurposing the affective magic of comedy as a device for re-wiring architectural history. As OfficeUS Partners, Cooking Sections speculate on US architectural exports by looking at the spaces of production and consumption of food. During the course of the project, they will develop a cookbook drawing from OfficeUS Repository and realize their recipes publicly. Originally from Spain and Argentina, Manuel studied at the Bartlett School of Architecture and holds an MA in Aesthetics and Politics from CalArts. Among others, he has worked for OMA /Rem Koolhaas and was project architect for David Chipperfield Architects from 2006 to 2012. Manuel is a co-founder of the experimental practice Hunter & Gatherer, dedicated to developing speculative projects on contemporary art, architecture and culture, and is a founding partner of Matterberg Architects, based in London and New York City. He has published and exhibited his work internationally and has taught at various institutions, including CalArts and the University of Southern California. Currently he is based in New York City where he is enrolled in the PhD in Architecture program at Columbia University and is a graduate fellow of the Institute for Comparative Literature and Society. As OfficeUS Partner, Manuel is interested in how to re-design “architecture” as a particular set of socio-technical practices connected to economic and political imaginaries. How do the theatrics of economization affect the architecture profession, and vice-versa? Are we doomed to be global financial capitalism’s window dressers? Can we think of other political capacities for architecture? Matteo is an architect, editor and publisher based in Milan. He has been guest professor at the Istituto Universitario d’Architettura di Venezia, the Politecnico in Milan, the Royal Danish Academy of Arts in Copenhagen and the Pontificia Universidad Javeriana in Bogotà. As founding partner of the research agency Multiplicity, his work has been exhibited at Kunstwerke in Berlin (2003), the Venice Biennale (2003), the Musée d’art moderne in Paris (2003), the ZKM in Karlsruhe (2004) and the Beijing Biennial (2004). In 2005, he founded the architectural office Salottobuono, which has served as editor of the Instructions and Manuals section of Abitare magazine (2007-10) and as creative director of Domus magazine (2011, 2012). 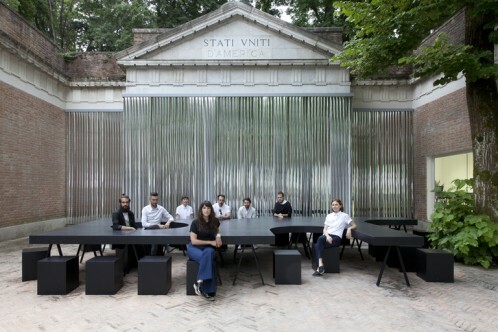 The office has taken part in the Venice Biennale (2008, 2012), published the Manual of Decolonization (2010) and designed the Italian Pavilion in 2010. Matteo is co-founder and Editor-in-Chief of San Rocco magazine, an independent international publication about architecture. San Rocco was awarded the Icon Award as best emerging architecture practice (2012) and the Graham Foundation Grant for Advanced Studies in the Fine Arts (2013). As OfficeUS Partner, Matteo Ghidoni is the Head of the Department of Radical Realism. Matteo deals with issues of extreme professional pragmatism and the logic of proper exploitation of given conditions as possible ways toward a truly genuine architecture for the city. Rather than focusing on singularity of buildings and the romantic figure of the architect, the department contributes to the construction of a shareable and manipulable knowledge of architecture.